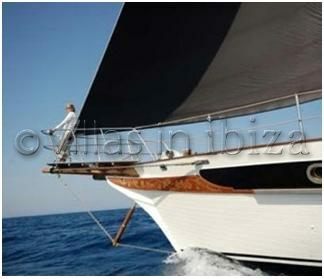 Explore the coastline of Ibiza Island on board of this classical elegant and stylish sailing yacht. It will take you back in time and you will feel like you belong at sea from the moment you step on board! This beautiful sailing boat has its distinctive features, b lack sails and warm teak decks are highlighted by the sumptuous interior of ruby reds, yellows and gold. While on deck take the opportunity to sunbathe, or just sit back and relax listening to the gentle sound of the waves. Below deck you can enjoy the luxury of the spacious saloon and open style, equipped galley. There are also three spacious berths, which you are welcome to use for that well- earned Siesta . All berths have been refurbished, ensuring your every comfort, whilst retaining the tradition and qualities that this boat encapsulates. So get ready to set sail from the port in Ibiza town on board this unique sailing vessel. The Captain will set sails towards the beautiful crystal clear waters of the neighbouring islands of Formentera and Espalmador.